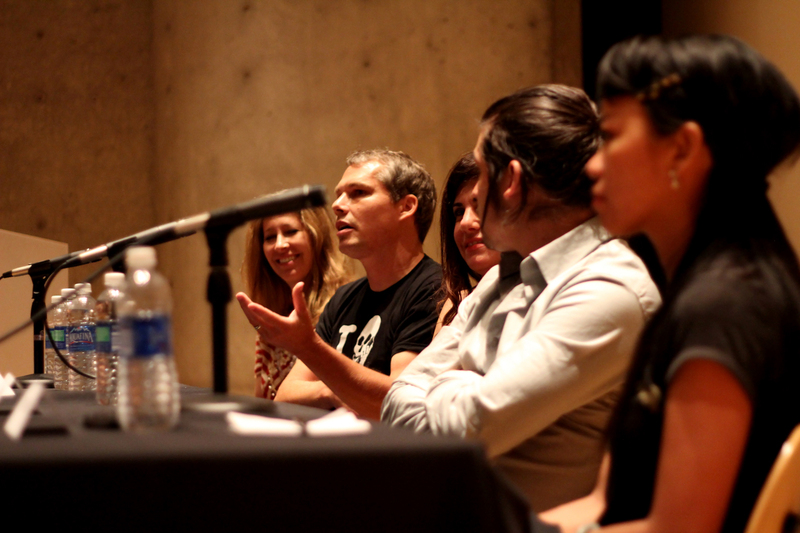 HuffPost Arts and The Museum of Contemporary Art, Los Angeles (MOCA) hosted a presentation and panel discussion given by Brooklyn Street Art founders Steven P. Harrington and Jaime Rojo Saturday at the Ahmanson Auditorium with 150 guests. Five days after the closing of the record breaking "Art in the Streets" show at MOCA, which was seen by over 200,000 visitors, BSA charted some new ground going forward in the ever evolving graffiti and street art movement. The panel, which included HuffPost Arts Editor Kimberly Brooks and Street Art phenom Shepard Fairey, watched an animated presentation by Harrington and Rojo about a new storytelling direction that artists are bringing to the streets of New York and other cities around the world. With examples of relative newcomers whose work had not been seen by many in the audience, they pointed to precursors from the last 40 years to this storytelling practice. They also questioned how the sudden growth of highly personal, labor-intensive works that have a narrative may be evolving what we have been calling "Street Art" for the last decade. After a conversation with panelists Brooks, Fairey, Marsea Goldberg, Ken Harman, and Ethel Seno, which covered topics like the paucity of females in the street art scene, the influence of the Internet on "getting up", and the significance of personal engagement in the work of many of today's new street artists, Harrington and Rojo opened the discussion up to the auditorium. Here topics ranged from LA's evolving approach to Street Art to include public and permanent art, the influence of money on street artists, and how a show like "Art in the Streets" effectively influences the next generations' perception of street art. The packed event was interesting enough to bring many audience members down to the stage after the show to continue the conversation and meet the panelists. LA MOCA Director Jeffrey Deitch, who took great interest in the presentation, even stayed a while talking with guests and panelists on stage. Fairey, with his wife Amanda at his side and a healing black eye from his recent trip to Copenhagen (see his account for HuffPost Arts here) gamely took on questions from many in the audience and posed for pictures after the event and at the reception that HuffPost Arts hosted afterward. See our interview on HuffPost Arts "Shepard Fairey : Too 'Street' For Corporate, Too Corporate For The Street"
"Red Hot and Street: 'Art in the Streets' Brings Fire to MOCA"
"Hitting Up LA: The Streets Outside the Show (SLIDESHOW)"
See all the pieces in "Street Art Saved My Life : 39 New York Stories" a show curated by Steven P. Harrington and Jaime Rojo now on view at C.A.V.E. gallery in Los Angeles until September 4. 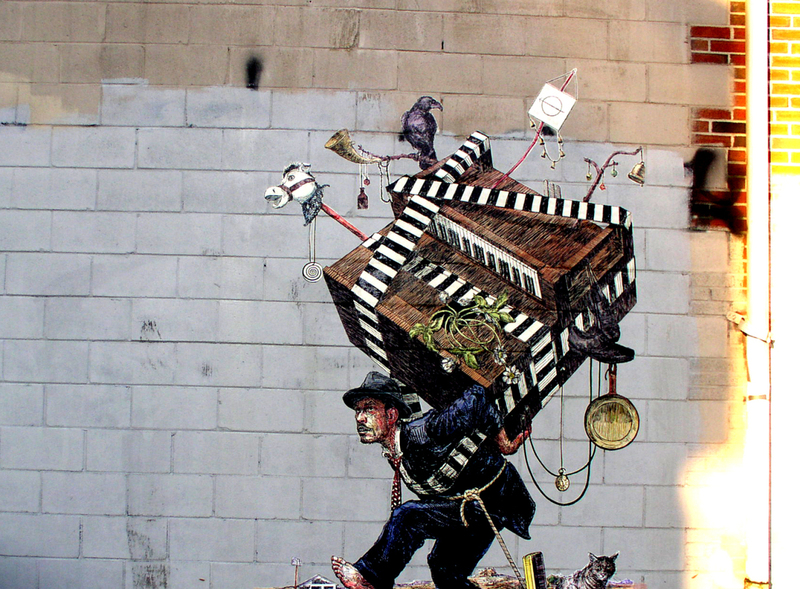 See new images from around the world of Street Art and read scintillating interviews every day on Brooklyn Street Art.